Sachin Tendulkar hit the winning runs as India sealed a seven-wicket victory over Australia on the final day of the second and final Test in Bangalore. They successfully chased 207 - the highest fourth-innings score to win at the ground - after Australia were bowled out for 223 in their second innings. And although it was Tendulkar who hit the winning runs to finish unbeaten on 53, having made 214 in India's first innings of 495, the innings of the final day came from debutant Cheteshwar Pujara, who stroked a stylish 72 to help resurrect the innings following the early dismissal of Virender Sehwag for seven. Australia began the day on 202 for seven and they could only add 16 runs before they were bowled out, giving India ample time to chase down the runs. Zaheer Khan struck first to bowl Mitchell Johnson for 11, Ben Hilfenhaus was bowled by Shanthakumaran Sreesanth, failing to score and Peter George edged Zaheer to Mahendra Singh Dhoni, also failing to score. 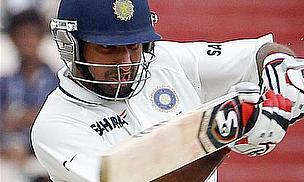 Zaheer and left-arm spinner Pragyan Ojha both returned three wickets, the former conceding 41 runs and the latter 57. Sehwag then went early, caught by Tim Paine off Hilfenhaus but steady batting from Murali VIjay (37) and Pujara, promoted to bat at number three under intense pressure. He responded with some excellent strokes, hitting seven fours before he was bowled by Hauritz, having already seen Vijay depart when he was trapped in front by Shane Watson. That left the experienced pair of Tendulkar and Rahul Dravid (21 not out) to steer India to victory, the winning runs coming when Tendulkar flicked Hauritz fine for a couple of runs. India won the opening match by one wicket in Mohali and India had not won a Test in Bangalore for 15 years previous to this match.